Laparoscopic distal pancreatectomy (LDP) is being increasingly performed with some concerns regarding the cost of the minimally invasive approach. The purpose of this study was to assess the cost-effectiveness of LDP versus open distal pancreatectomy (ODP). A retrospective clinical and cost-comparison analysis was performed for patients who underwent LDP vs. OPD between 2005 and 2011. Data considered for the comparison analysis were: operative costs (surgical procedure, operative time, blood transfusions), postoperative costs (laboratory testing, hospital stay, complication management, readmissions), and overall costs. 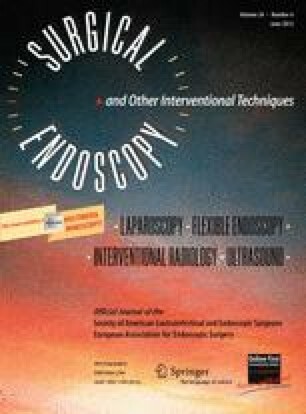 Fifty-one distal pancreatectomies (laparoscopic = 35, open = 16) were performed during the study period. The median operative time was 200 (range, 120–420) min for LDP vs. 225 (range, 120–460) min for ODP (p = 0.93). Median blood loss was 200 (range, 50–900) mL for LDP vs. 394 (range, 75–2000) mL for ODP (p = 0.038). Median hospital stay was 7 (range, 3–25) days in the laparoscopic group vs. 11 (range, 5–46) days in the open group (p = 0.007). Complication rate was 40% for LDP vs. 69% in ODP (p = 0.075). Postoperative intervention was required in 11% of patients after LDP vs. 31% after ODP (p = 0.12). The average operative, postoperative, and overall cost was £6039 (range, £4276–£9500), £4547 (range, £1299–£13937), £10587 (range, £6508–£20303) vs. £5231 (range, £3409–£9330), £10094 (range, £2665–£39291), £15324 (range, £7209–£47484) for the LDP and ODP groups, respectively (p = 0.033; p = 0.006; p = 0.197). We showed that LDP is feasible and safe without having a negative impact on cost. Extensive experience in pancreatic and laparoscopic surgery is required to optimize surgical outcomes. Mr. Mohammad Abu Hilal, Mr. Mohammed Hamdan, Mr. Francesco Di Fabio, Mr. Neil W. Pearce, and Mr. Colin D. Johnson have no conflicts of interest or financial ties to disclose.